I appreciate the work of Vice News in reporting on the ground the conflict in Ukraine this past year. Watch this video. What’s being done by the Russian-backed rebels in the so-called Donetsk People’s Republic against non-Orthodox Christians is deplorable. The world needs to know. Pray for these Christians and for Ukraine. Yesterday I taught on the famous sayings of Jesus to his disciples, that they are the salt of the Earth and the light of the world. (You can listen to that message here). Jesus makes his point there, that no one lights a lamp and then hides it under a basket, but they put it on a lamp stand, so it can be seen by all. Just as a city on a hill can not be hidden, Jesus’ disciples are not meant to keep their faith a secret. Yesterday in Pakistan, 10 more Christians were killed in the bombing of a Christian church. This makes for 25 total deaths of Christians in targeted attacks over the past few days. ISIS is going around systematically targeting and murdering Christians in the Middle East. Christians in the West have little concept of the implications of Jesus’ words for these Christians! In the West, the greatest persecution we face for not hiding our Christianity, is that people will think we are religious fanatics. But for the most part, being a Christian is still a perfectly acceptable thing to be in our society. There is honestly not a great temptation, unless you are an extremely insecure person, to hide the fact that you are a Christian. However, if being a Christian, and not hiding it, means that ISIS is going to come for you and your family, if not hiding the fact that you a Christian means that you might face fatal attacks at any moment, then the temptation is HUGE to want to hide your light under a basket – because if you put it on a lamp stand, then you become a target. In the Beatitudes Jesus describes the kind of people who will be his disciples: they will be meek, they will hunger and thirst after righteousness, they will be peacemakers, they will be pure of heart. When you read those characteristics, you might thing: Wow, those sound like the greatest people in the world! That’s the kind of person I’d like to have as my best friend! But, surprisingly, Jesus then says that these kinds of people will be persecuted by the world. (Matthew 5:11-12) You might wonder: Who would want to hurt these kinds of wonderful people? But you have to look no further than Jesus. He embodied all of those wonderful characteristics, and people beat him and nailed him to a cross. The situation with Christians around the world facing increased persecution, especially in Muslim-majority countries, should be a wake-up call to Western Christians – and should teach us something about the nature of what it means to be a Christian. Western Christianity, in my opinion, faces a more insidious form of attack than the physical attack facing those in other parts of the world. Here, our culture pressures us to make Christianity a private thing, that we are free to do, but only behind closed doors. As a result, we have ended up with a form of Christianity that is very introspective and less mission-focused. In other words, Western society has sought to domesticate Christians, remove their claws and potty train them. They are not trying to scare us into hiding our light under a basket, like ISIS and other radical Islamists do, but rather to coax us into putting a basket over our light, so as not to disturb others with it. We must remember the words of Jesus: that to hide our light is to betray our very design and purpose as Disciples of Jesus in the world. 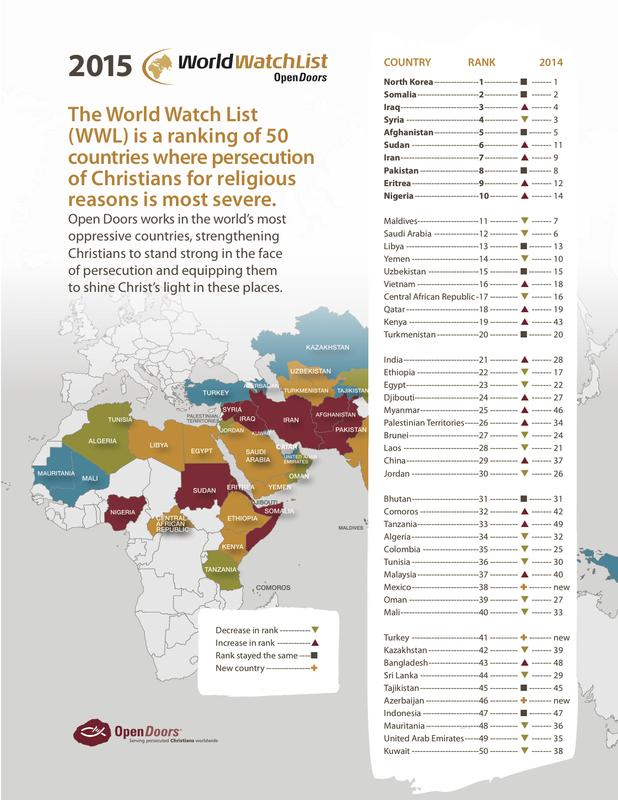 An interesting article from Christianity today on the top 50 countries where Christians face the most persecution.